2014 was a relatively quiet one for the team compared with recent years with 95 ‘999’ calls. This review considers the 2014 statistics, both for the year as a whole and in the wider context of the past 11 years. In total 1123 incidents are included in the review. The presentation of data and definitions used is the same as that used in previous reviews published on the team website. These are repeated at the end of this article. The graph above shows that since 2007 calls to the team have increased on previous levels, peaking in 2009. It is tempting to see the past 2 years as a decreasing trend although caution is advised as this may just be variation around a level. 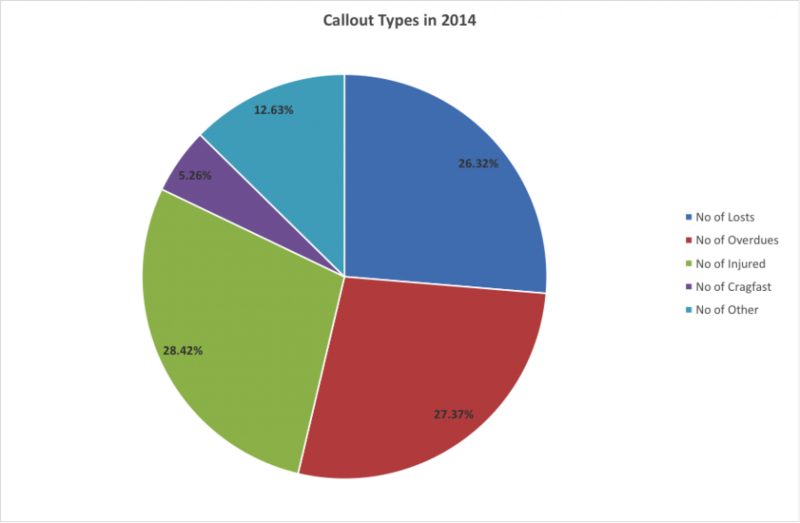 The graph also shows the reduction in 2014 was reflected in all callout categories evenly. 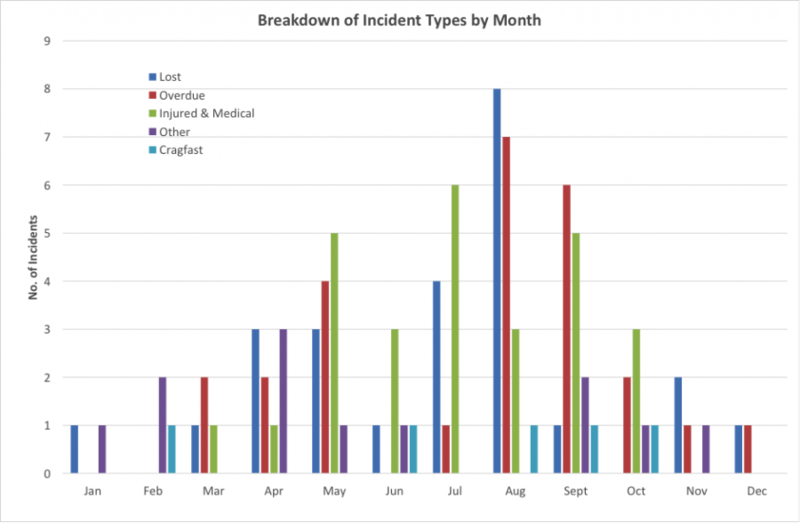 The PIE chart below shows a breakdown of the 2014 incidents by type. The most common reason for a 999 call was an injury or medical condition, representing 29 % of calls received. 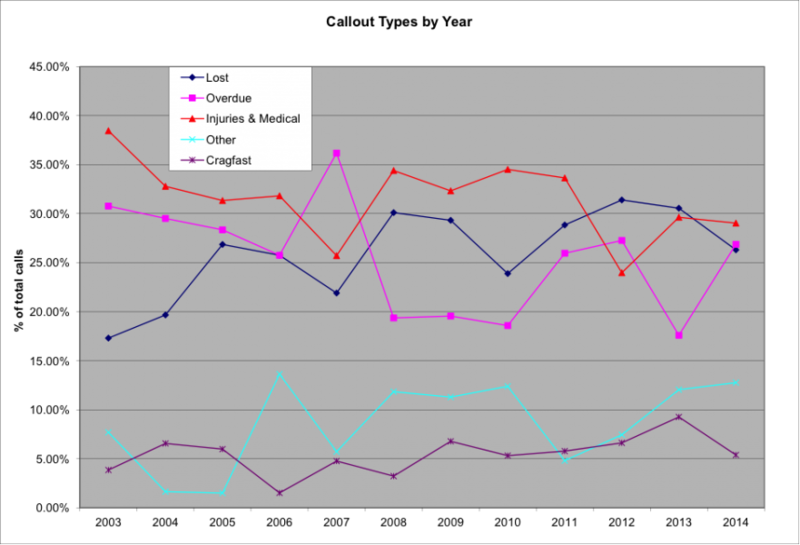 Over 11 years the proportion of injuries is 31 % and this remains relatively constant. Overdues were the next most common at 28 %. Over the years the proportion of overdue is somewhat variable. Losts were in third place, unlike recent years on 26 %. Others had a slight increase. This reflected a number of searches / water related incidents away from the mountains rather than any significant bad weather responses as in previous years. The plots below show the breakdown of calls by month of the year for 2014 and for the past 11 years as a whole. 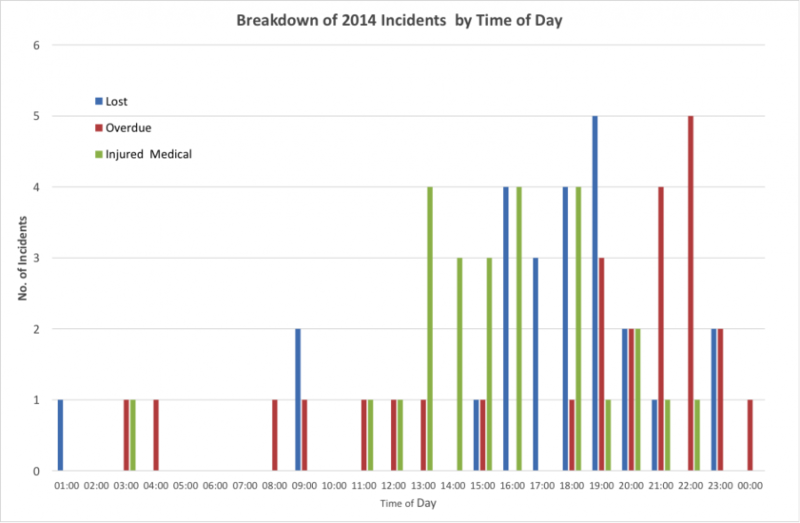 The breakdown of calls by time of day is shown below, both for 2014 and the past 10 years as a whole. 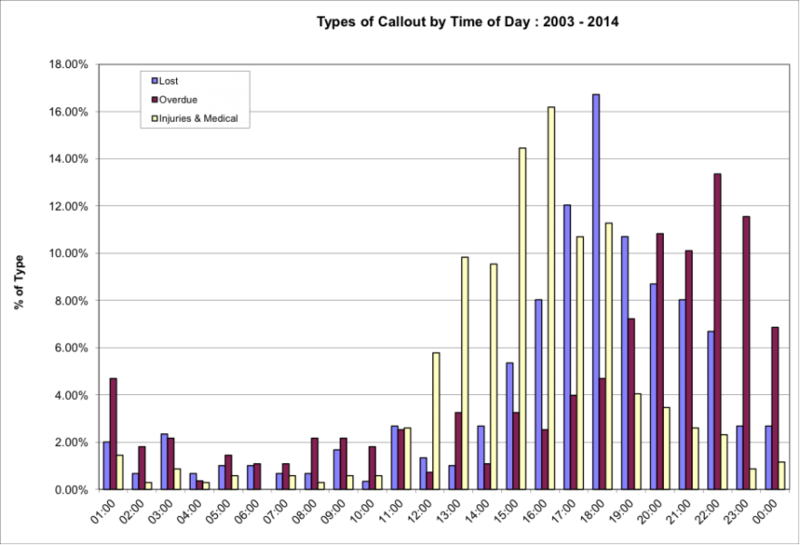 The x-axis is the highest value of each data ‘bin’, ie : 13:00 is all times from 12:01 – 13:00 and so on. In common with the long term trend August was the busiest month in 2014. 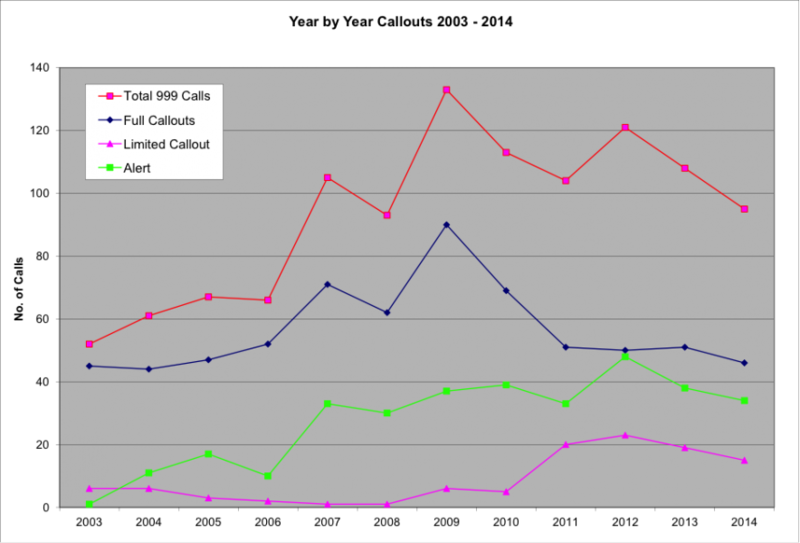 What is different is the relative lack of calls in June and July, at the height of the 3 peaks season. This may represent a change or just reflects the sustained good weather in the middle of the summer. The breakdown by time of day follows the regular trend. Two thirds of injuries and medical incidents happen between 12:00 – 18:00. 70 % of Losts happen from 15:00 – 20:00 and 61 % of overdues are reported between 18:00 – 23:00. 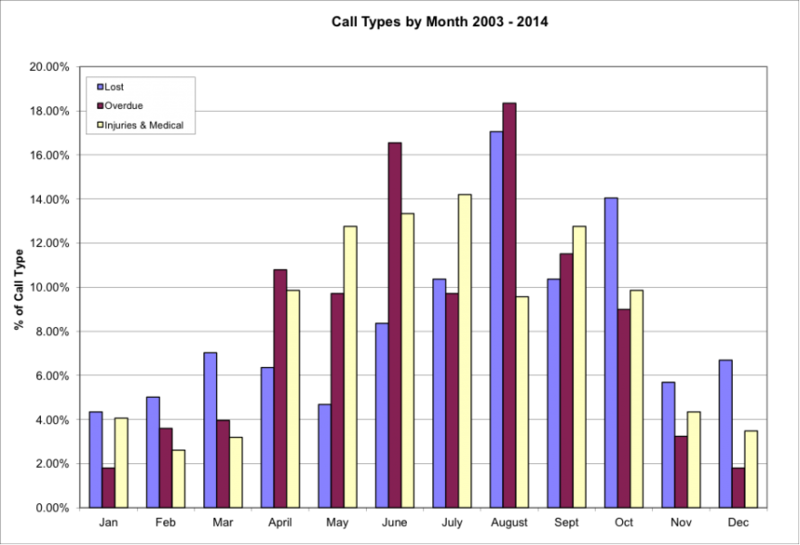 Overall the graphs show Wasdale is busiest in the spring / summer months and the incidents occur in the afternoon / evening.